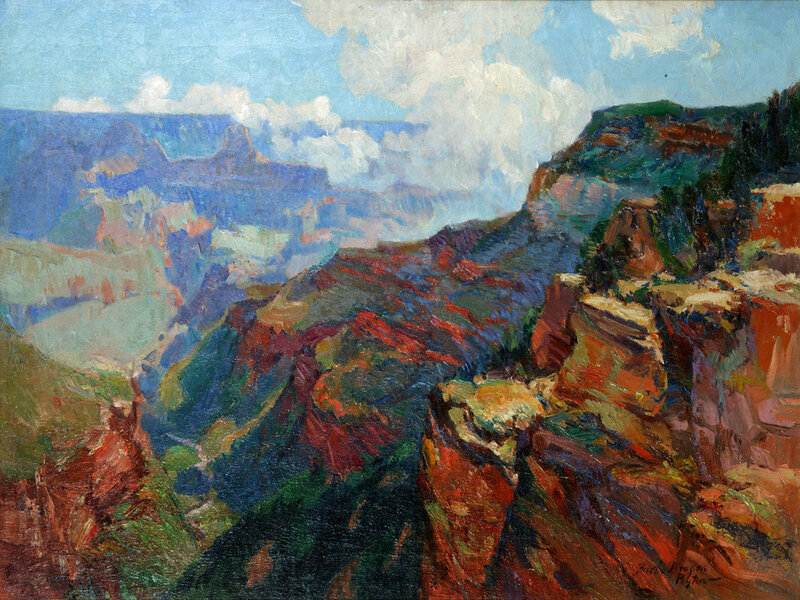 Bertha Sophia Menzler Peyton, Grand Canyon, Oil on Canvas, Courtesy of the Huntsville Museum of Art. The Huntsville Museum of Art has achieved many milestones since its inception in 1970, but the acquisition of the Sellars Collection of art by American women represents a truly redefining moment. The group of nearly 400 artworks heralds the achievements of some 250 women artists active between the mid-19th and mid- 20th centuries. Many rebelled against the convention of their day by exhibiting alongside their male counterparts, receiving awards and pioneering the way for those who would follow. Today’s art historians are rediscovering these women and helping to establish their rightful place in the expanding narrative of American art. Rebels With a Cause: American Impressionist Women features over 70 works from the Sellars Collection that exemplify the strong effect that French Impressionism had on late 19th-century American art. This exhibition features paintings and works on paper that embody the early influence of French Impressionism and its precursor, the Barbizon Style, along with works that adopt the various hallmarks of what became known as the American Impressionist style. The exhibition concludes with works that branch out beyond the strict definitions of Impressionism, incorporating other modern movements and more individual artistic approaches. Impressionism developed in France in the late 19th century in opposition to the conservative traditions of the art academies. These sanctioned institutions advocated the depiction of ambitious historical, mythological or religious scenes, rendered with great technical skill. French Impressionists challenged these conventions by painting casual subjects such as natural landscapes and people at leisure. They often applied their paint in thick, rapid strokes of highly keyed color to record an “impression” that the eye could quickly read and complete. The forerunner of French Impressionism developed in the village of Barbizon, with a group of artists who painted en plein air (out of doors) in an attempt to capture the fleeting atmosphere of a scene at a precise moment in time. This was very different from the academic approach to painting from one’s imagination in a studio. Barbizon artists also focused on new subject matter, including intimate woodsy landscapes, which the academies did not consider as serious art. By the 1890s, the foundations had been laid for the acceptance of Impressionism in the United States. Exhibitions of French Impressionist art had been held in Boston and New York, and unlike in Europe, were accepted by critics and public alike. Wealthy Americans became avid buyers of the new art. Artists and students began to travel abroad to study its techniques at places like Giverny, the village near Paris where French Impressionist Claude Monet lived. American women artists like Lilla Cabot Perry were early advocates of the style, and along with others played an important role in helping establish Impressionism in America. Many American artists of the turn of the 19th century felt the allure of the Old World and chose to study in Europe, where the academies and private art studios had more prestigious reputations than emerging American art schools. Some artists, like James McNeill Whistler, Mary Cassatt and John Singer Sargent, launched successful careers in Europe and essentially remained there for the rest of their lives. Others looked to Europe as a source of inspiration for subject matter, which they increasingly chose to render in the newly fashionable Impressionist style. During this period, Wealthy Americans began to visit Europe in great numbers to make the “Grand Tour,” traveling to England and continuing through France, Switzerland, Italy and often Germany and the Low Countries. They were attracted to the Continent’s cultivated and civilized antiquity, which offered an atmosphere that their native country did not possess. Upon returning home, they created a ready market for paintings that reminded them of the storied places they had experienced. Unlike their French counterparts who were breaking with a bureaucratic art establishment, American artists approached Impressionism from individual perspectives. Many adopted the broken brushwork and fleeting light effects that the French Impressionists championed, but did not abandon the principles of figure drawing and composition championed by the academies. They quickly applied the new style to American subject matter, exploring the nation’s unique and varied landscape as well as aspects of everyday American life. As regional painting schools developed in New England, the Midwest, and on the West Coast, Impressionist scenes of locales in and around Cape Ann, Massachusetts; Brown County Indiana; and Carmel, California became increasingly popular.